Ok, ok, just one more pumpkin recipe this year. I promise. I just wanted to get one more recipe in before Halloween. In the States, pumpkin is seasonal. We use actual pumpkins as a Halloween decoration carving scary faces into them and sticking them on the front stoop with a lighted candle inside. By the time Halloween fades into the mist, the pumpkin is all sooty and sometimes moldy on the inside. So, most people chuck those and make their Thanksgiving (another big holiday, which is celebrated at the end of November) Pumpkin Pie mostly using the processed canned stuff. Pumpkin handed to me on a silver platter. 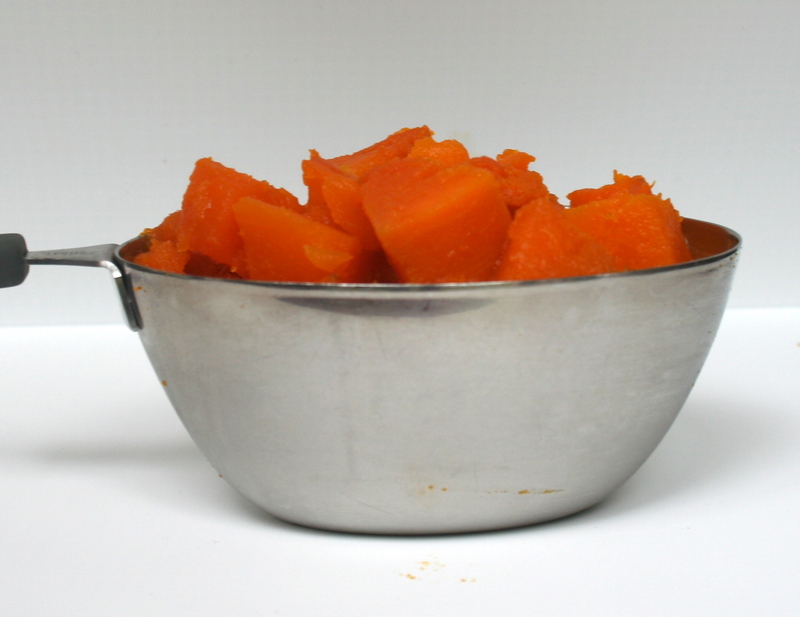 While I was growing up, pumpkin was used as a decoration or to make pie. That was it. The pumpkin horizon has exploded. Pumpkin is now the autumn ‘it” ingredient with 123 million “pumpkin recipe” Google hits. In the States pumpkin comes whole or in a can – no in between. I love that here pumpkin comes ready to create and available year round. 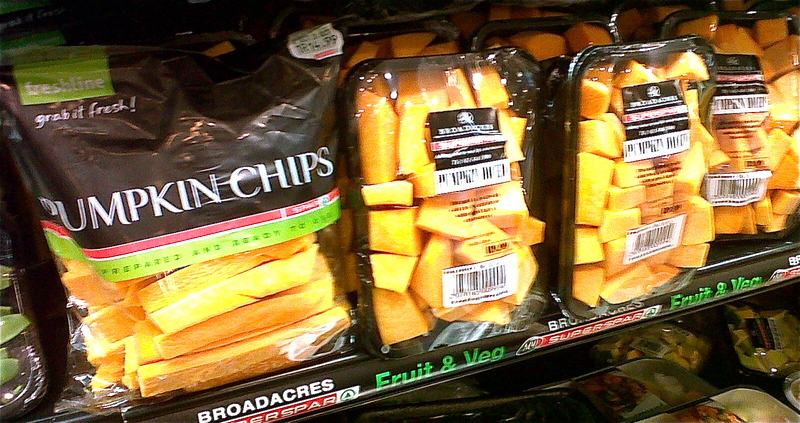 By the way, I would love to know what South Africans do with pumpkin? If you can’t think of anything, I have an idea. 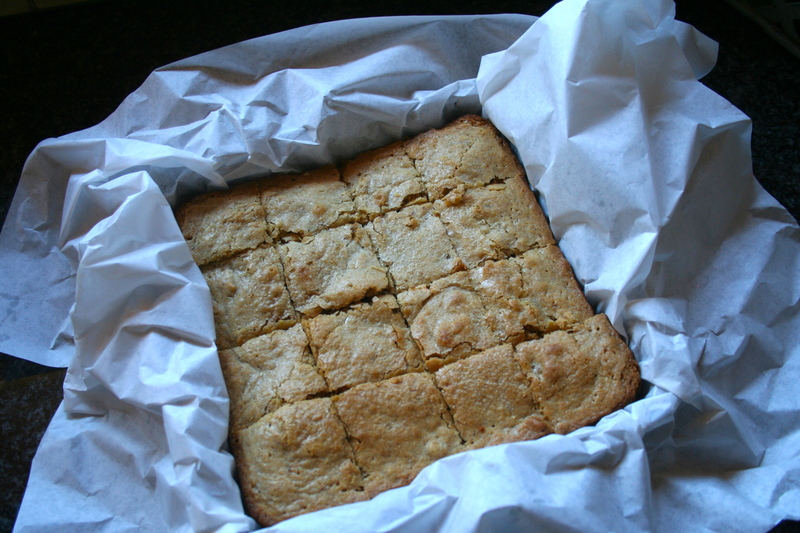 Make these incredible White Chocolate Pumpkin Brownies for your little goblins this Halloween! And, don’t forget to let me know what you do with all that pumpkin! I adapted these brownies from the Cooks Illustrated Chewy Brownies recipe. Sprinkle chopped White Chocolate into a large mixing bowl. Pour in boiling hot water. Mix. You may not think the White Chocolate is necessary, but my taste testers all loved the White Chocolate version best. Add oil, butter and eggs. Mix well. The science behind Cooks Illustrated’s Chewy Brownie recipe is that there has to be a balance between saturated fat and non saturated fat. Furthermore, additional egg is needed to bind the fat so you don’t end up with a greasy brownie. Add the sugar and the vanilla. You don’t need to lug out the mixer or blender for this. Just mash the pumpkin with a fork. This is how I measured a “heaping” cup of pumpkin. It looks like more than a cup, but when you mash it down, it will only be about a cup. 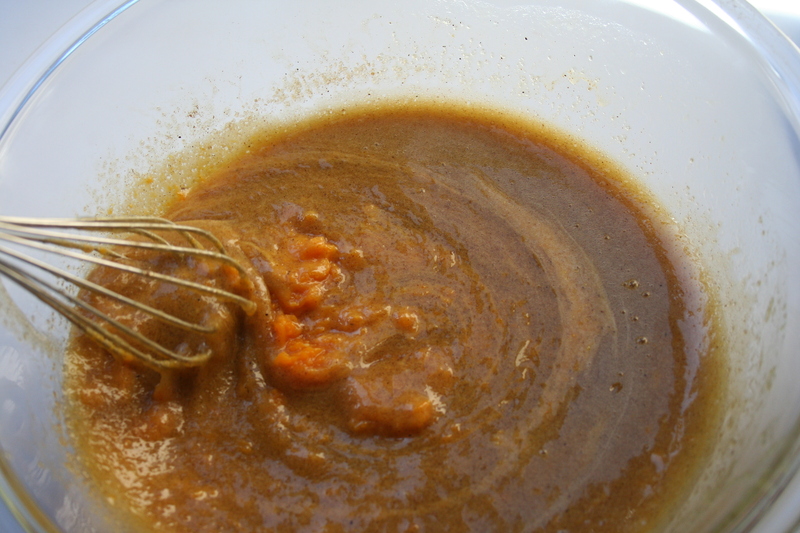 Add pumpkin and give the mixture a good stir. 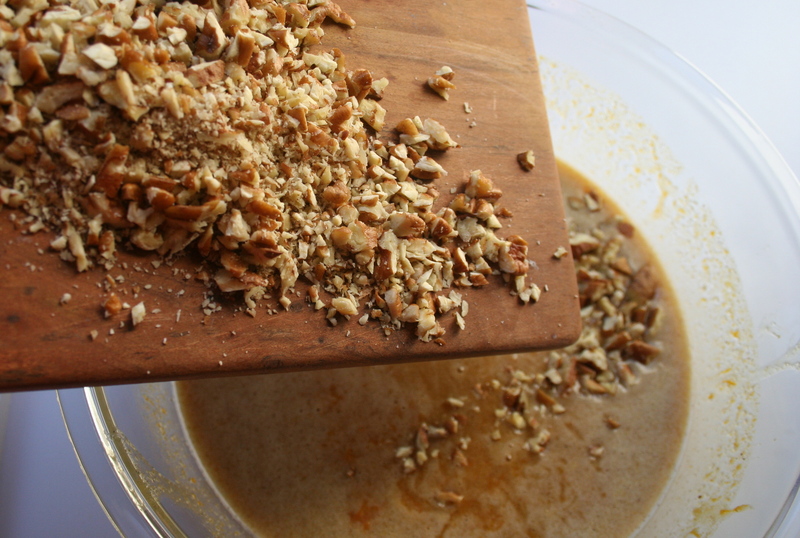 Add the pecan nuts and blend. Add flour in small batches mixing well after each addition. I love a deep thick brownie so I used a smaller square pan. You can use a larger shallower rectangular pan to achieve a shallower larger sized brownie. Oh, and did I mention pumpkin is a superfood? 500 grams (2 cups) granulated sugar. I used brown granulated sugar. Preheat oven to 175C (350F). Prepare pan by buttering generously then coating with a thin veil of flour by sprinkling about a tablespoon of flour into the pan and rotating flour in pan so flour coats all inside surfaces. Set aside. 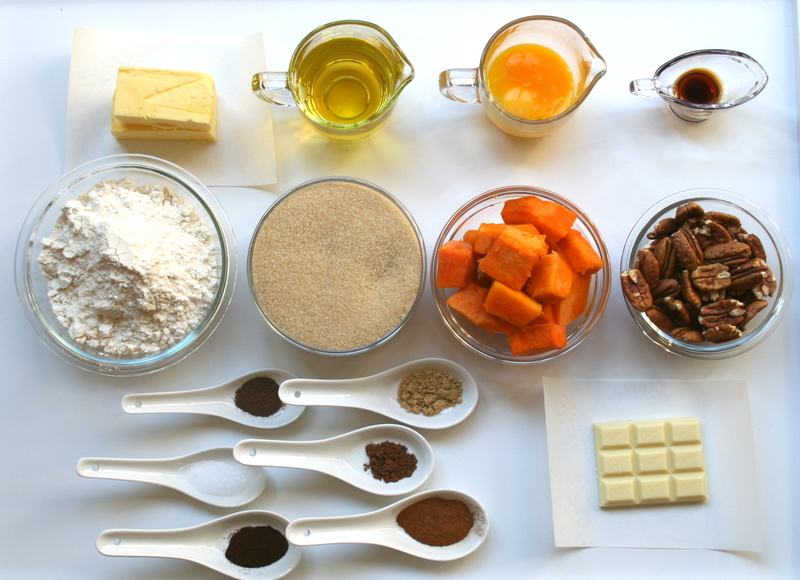 Whisk finely chopped white chocolate and boiling water together in a large bowl until chocolate is melted. 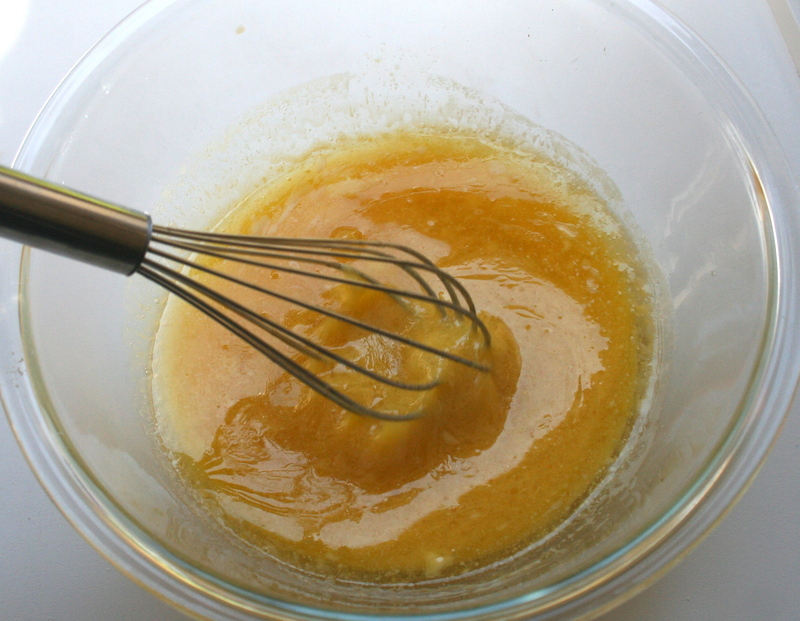 Whisk in oil, melted butter and beaten eggs. Whisk in sugar until fully incorporated. Then add vanilla, spices and salt. Add flour in 3 batches mixing with a spoon or spatula after each addition. 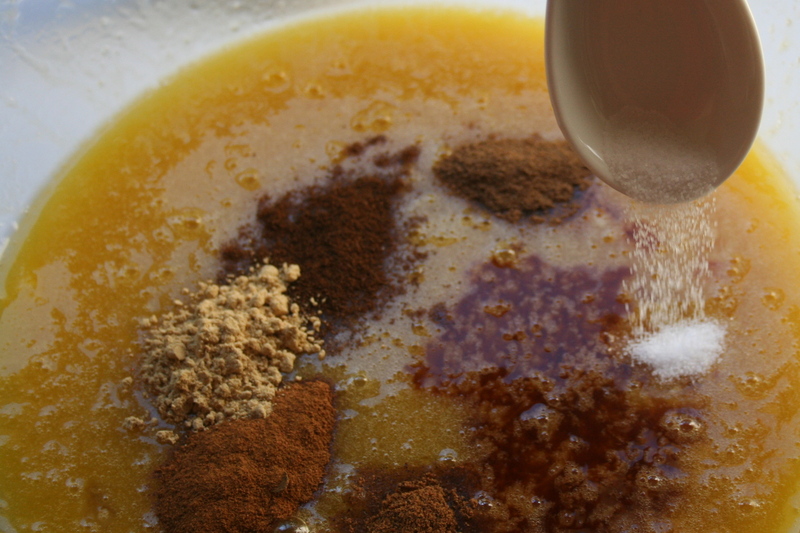 Make sure flour is fully incorporated but care not to over mix. Put in preheated oven and bake for about 30 – 40 minutes at 175C (350F). Check for doneness by sticking in a tooth pick in the center and it should come out clean. Do not overbake.